Conservative strategy offers low-risk high-yield opportunities. No-loss rate is pretty high if break-even is applied. Support/resistance is difficult to formalize. Any currency pair and timeframe should work, but longer-term timeframes (such as H4, D1 and W1) should work better. he pattern consists of three bars: the left eye, the nose and the right eye. The left eye should be a bar up for the bearish Pinbar pattern or a bar down for the bullish pattern. 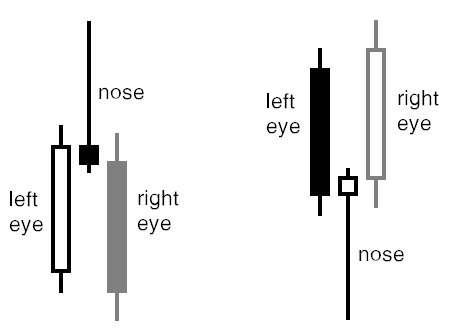 The nose bar should open and close inside the left eye, but its high (or low, for the bullish set-up) should protrude much farther than the left eye's high (or low). Both the nose bar's open and close should be located in the bottom (top, for the bullish set-up) 1/4 of the bar. The right eye is where the trading happens. An additional condition for the good pattern set-up is the strong support/resistance level formed either behind the eyes or near the point of the nose. The stronger are the support/resistance levels you incorporate into this pattern, the more accurate it will be. Aggressive entry option is to enter a position when in the right eye price retreats behind the left eye's close level. Conservative entry point is below (above for bullish set-up) the nose bar. Conservative stop-loss can be set behind the nearest support/resistance level behind the eyes. A less conservative approach would be to set stop-loss to immediately behind the nose bar point (in this case, your reward/risk ratio may suffer). Conservative take-profit can be set immediately after the left eye low (high for the bullish set-up). Aggressive take-profit level may be placed farther — to the next strong support (resistance for bullish positions) level.